Located in the southern coastal region of Bahia, Brazil, Ilhéus is a colourful city famed for its beautiful beaches and cocoa plantations. Founded in 1534, the city’s cultural heritage is portrayed in its Portuguese buildings, colonial history and distinctive cuisine. 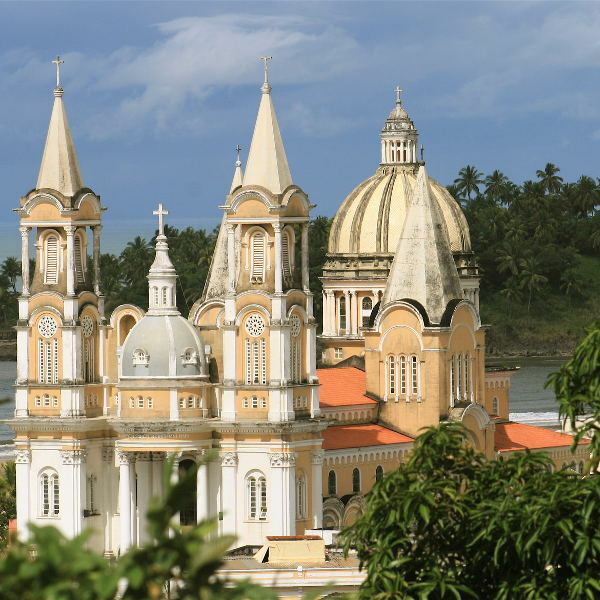 The hometown of Brazil’s most popular writer, Jorge Amado, Ilhéus is home to many museums, churches and monuments. Explore the blissful beaches and colourful history of this laidback city with cheap flights to Ilhéus! Ilhéus is home to Ilhéus Bahia-Jorge Amado Airport (IOS), a short 10-minute drive from the centre of town. Ilhéus Bahia-Jorge Amado Airport serves a multitude of airlines, including Avianca Airlines, Azul Airlines and LATAM Airlines Brazil. Direct flights are unavailable from South Africa, but popular connecting flights depart from Cape Town, Johannesburg and Durban. The narrow streets of Ilhéus tell many stories of a once prosperous trading village. Peruse the old streets, discovering quaint cafés and dated icons like Bataclan and Sao Sebastiao Cathedral. Relax in the warm, summer glow, sipping a refreshing caipirinha against a backdrop of breezy coconut trees. The sprawling beaches stretch on for miles, dotted with white-washed sailing boats – a picture of perfection! Sample the flavours of Brazil with traditional Bahian cuisine like moqueca and spicy vatapá. 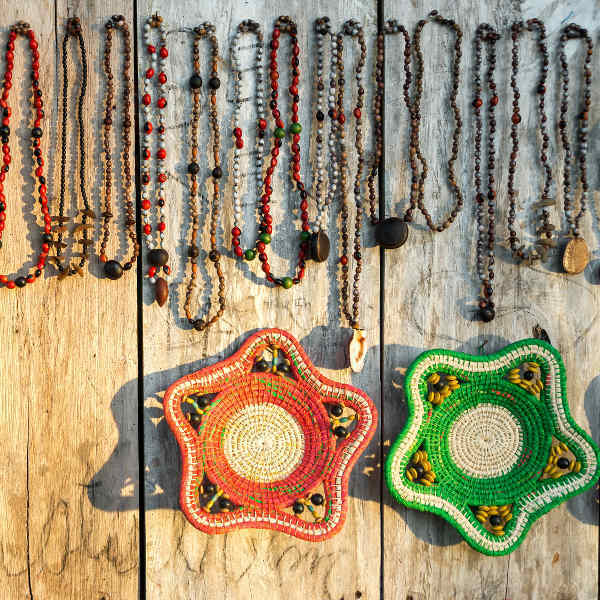 The bustling artisan market of Mercado de Artesanato is a great place to pick up beaded jewellery and handmade Bahian souvenirs. With its sugar-sand beaches and warm, turquoise waters, Ilhéus is an all-year-round destination. The Brazilian high season is typically between December and March, when the city is draped in music, entertainment and a vibrant nightlife. Be prepared for higher hotel rates and bustling crowds. The sweet spot is during spring (October-November) when the balmy skies and fewer crowds make for a perfect day at the beach! The period from April to July sees high rainfall and humidity levels, and is not a favourable time to go. 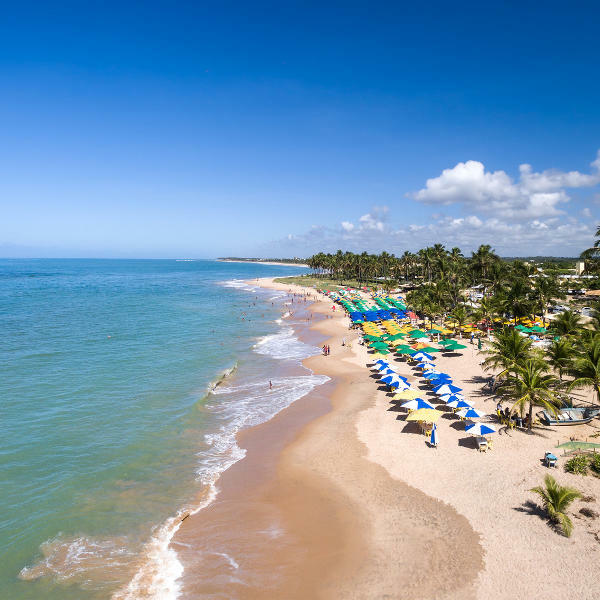 The Brazilian city of Ilhéus, once famed for its cocoa production, is located along the Cocoa Coast in the state of Bahia. Glimpses of the town’s former wealth are evident in the colonial buildings and mansions once built by wealthy plantation owners. Known as the Land of Chocolate and the Cocoa Capital, 19th century Ilhéus was the central trading point of cocoa to the rest of the world. Its trade legacy is present in places described in the novels of Bahian writer, Jorge Amado, whose father built the family home-turned-museum. The historical streets house colonial structures and gargoyle buildings like the Prefeitura, the iconic Sao Sebastiao Cathedral, Sao Jorge dos Ilhéus Church and Paranagua Palace (now a city hall). The Ilhéus of today is characterised by colourful, early-20th-century architecture and oddly-angled streets. Its magnificent landscape is made up of native mangrove everglades and stretches of beautiful white-sand beaches. Hire a bicycle and tour the cocoa farms that are still in operation on the outskirts of the city. See the ruins of the Esperança Sugar Mill, which is now the Botanical Garden. Spend your days lounging on the inviting, sugar-sand beaches of Praia do Sul, Praia dos Millionarios, Cururupe and Canabrava. Compare several airlines, and book your cheap flights to Ilhéus online at Travelstart! South African passport holders do not require a visa for a stay of up to 90 days for tourism or business purposes. Passports must be valid for at least six months prior to expiration date with at least two blank pages available for stamps. Brazil does not require any Yellow Fever certificate of vaccination to enter the country. However, the South African authorities may require a valid Yellow Fever international certificate when returning to South Africa. It is not advisable to carry large sums of money or visible electronics when walking around – be discreet. Keep money and passports securely zipped in a traveller’s purse or locked in your hotel safe. Stick to bottled water - always check the colour of the water and ensure the seal is not broken to avoid consuming bootleg bottled water. Do not walk the streets at night, rather use a taxi. When going to the beach, bring just enough money for chair and umbrella rental and any refreshments. Should you require medical assistance, you can go to the free public clinics called “posto de saúde” where some of the nurses may speak a little English. Pharmacies sell over-the-counter medication for a variety of conditions. Bring a strong sunscreen and insect repellent to keep pesky mosquitos at bay.